While our collective attention here in the United States has been focused on extreme weather events, flooding in Louisiana , wild fires in California and others, the associated loss of life, thousands of evacuees, and human suffering all around; not forgetting the horrible plight of the Syrian people represented by the shell-shocked bleeding little boy whom we saw on our TV screens after being rescued from under the debris of a demolished building bombed by the Syrian government supported by Russia’s Putin, the northern hemisphere tropics have stealthily converted storm cells and disturbed weather into tropical waves, and tropical cyclones! Today, Friday 19 August of 2016, there are five active tropical storms and two tropical waves in the Atlantic and the Pacific. Tropical storm FIONA continues to move WNW over the central Atlantic, while it is being chased by a large tropical wave just west of the Cape Verde Islands. 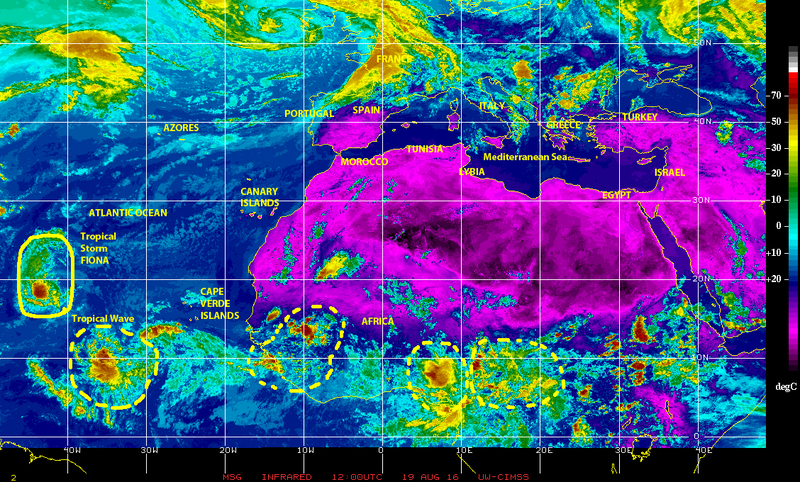 Not far behind to the east, over equatorial Africa there is plenty of tropical activity over the ‘tropical wave assembly line’. So, there is plenty of fuel for potential cyclonic activity as we approach the mid-point of the ‘official’ 2016 Atlantic hurricane season and what historically is the most active part of the annual season. Infrared satellite image of 19 August 2016 showing tropical waves and storm cells over equatorial Africa, which continue to move west toward the warm waters of the eastern Atlantic. Over the eastern north Pacific. off the coast of Mexico there is a newly formed tropical storm, the twelfth tropical cyclone of the Eastern Pacific season, which officially opened on 15 May, and numerous disturbed weather cells farther south and east off the coast of Central America, Panama and southern Mexico. Here again we see plenty of fuel for potential cyclonic activity in days and weeks to come. 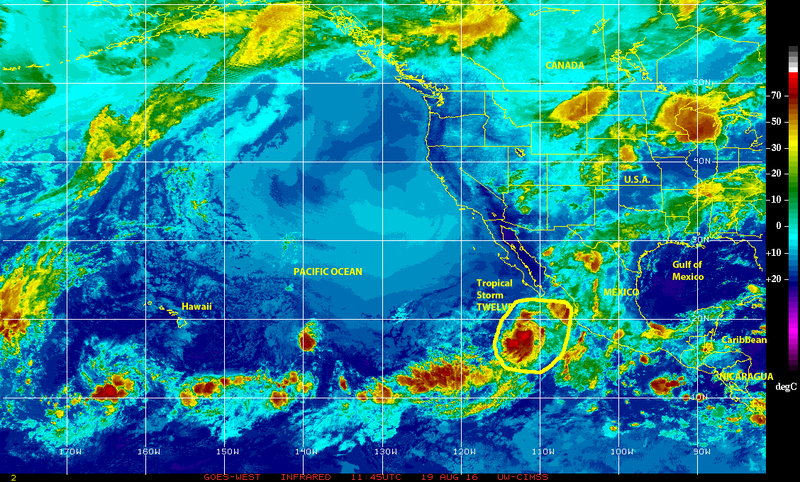 GOES West infrared sate;;ite image of 19 August 2015 showing the twelfth tropical cyclone of the season active off the coast of Mexico. 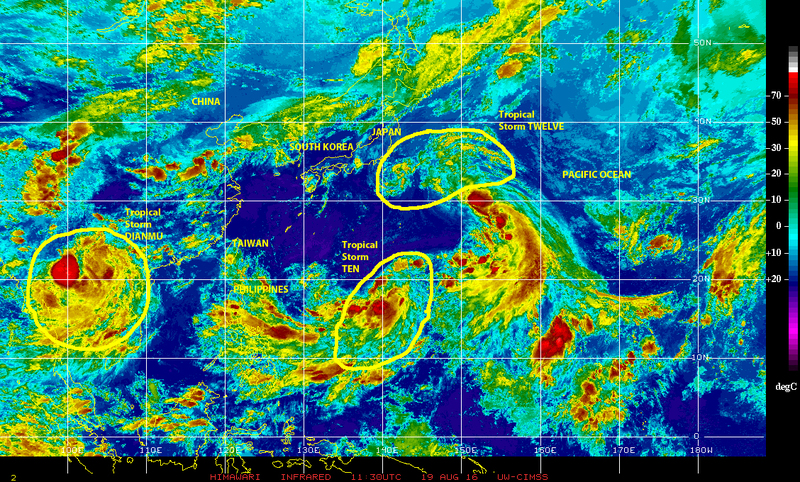 At the opposite end, over the Northwestern Pacific, there are currently three active tropical cyclone, including Tropical Storm DIANMU, and tropical storms TEN and TWELVE, as well as a large tropical wave, and storm cells following to the east. 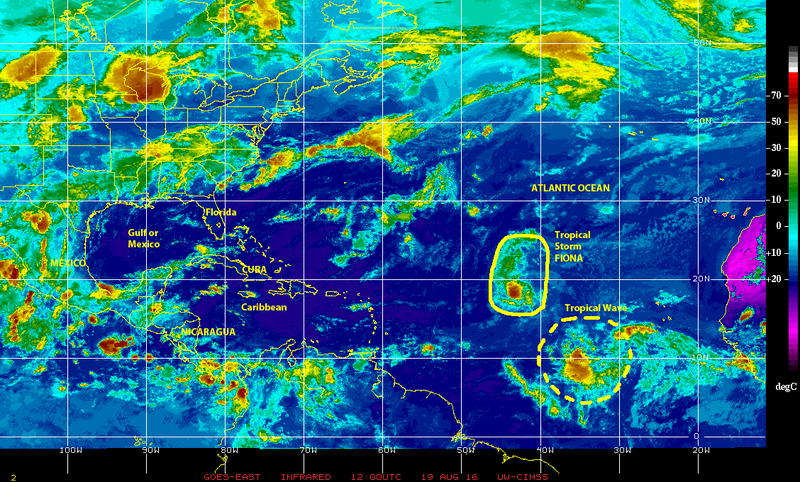 Infrared satellite image of 19 August 2016 showing Tropical Storm DIANMU, two other tropical storms, and a large tropical wave active over the Northwestern Pacific ocean. In summary, there is plenty of tropical cyclone activity on this day in the northern hemisphere, and abundant seeds for future potential cyclonic activity throughout the northern half of planet Earth in coming days and weeks. Be prepared. Remain alert. MITIGATE! Previous PostSubdued 2016 Tropical Cyclone Activity so far in the Northern HemisphereNext Post27 August 2016. Remain alert. Be prepared. MITIGATE!